One of the quieter nooks in Candolim, German Bakery is a small bakery-meets-cafe that does stellar cakes and coffee. It helps that it’s very easy to miss and a little far removed from all the action around the bigger shacks. The croissants and cinnamon rolls are baked fresh every morning and it’s criminal to miss out on the cakes. The chicken sandwich and momos (they’ll remind you of the hills) are quite the stars too, we’re told. Because we’d gone here post a meal, we only had enough stomach to try the cold coffee that came out perfectly sweet and strong (after our request to customise it this way) and chocolate chip cookie which was equally nice (buttery but not sickeningly chocolatey). This coffee outing was made infinitely better with a dog perched next to our chairs, demanding a piece of the cookie alternated with intermittent head scratches of course. Half the year in the hills, and the other half in Goa is how this cafe functions. 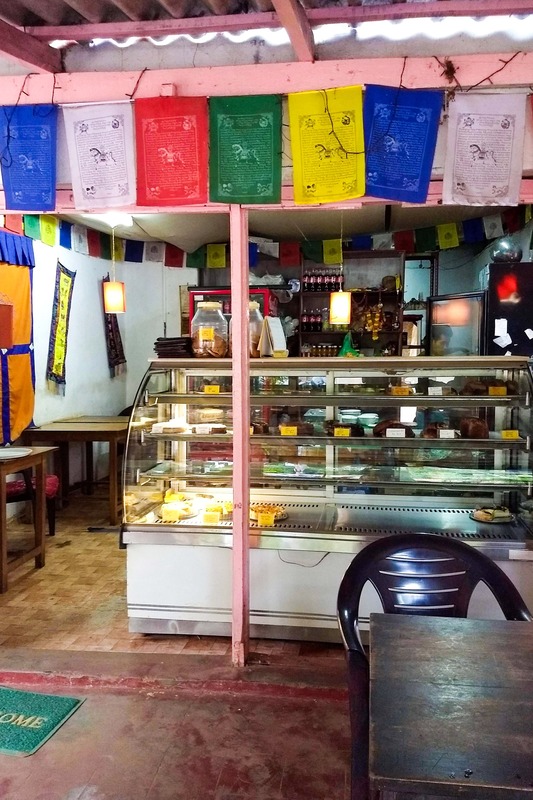 And, if you still haven’t been to the German Bakery in Anjuna (it’s massive and hugely popular), we’re sad to break this to you but you’ve been living under a rock. This Candolim one, however, is as old school as it gets and a world away from Anjuna’s madness. It’s also a place that’s got a loyal fan base including long stay tourists and seekers of cute bakeries who keep coming back. To add to this, they’re quite reasonably priced for everything between lemon cake to breads. I wish they had more seating. They open around 8am and serve a phenomenal English breakfast and a bowl of muesli to beat last night’s hangover. We suggest taking a seat that overlooks the road so you can watch the world go by. Oh, and if you’re lactose intolerant, you can get your coffee in soy milk.